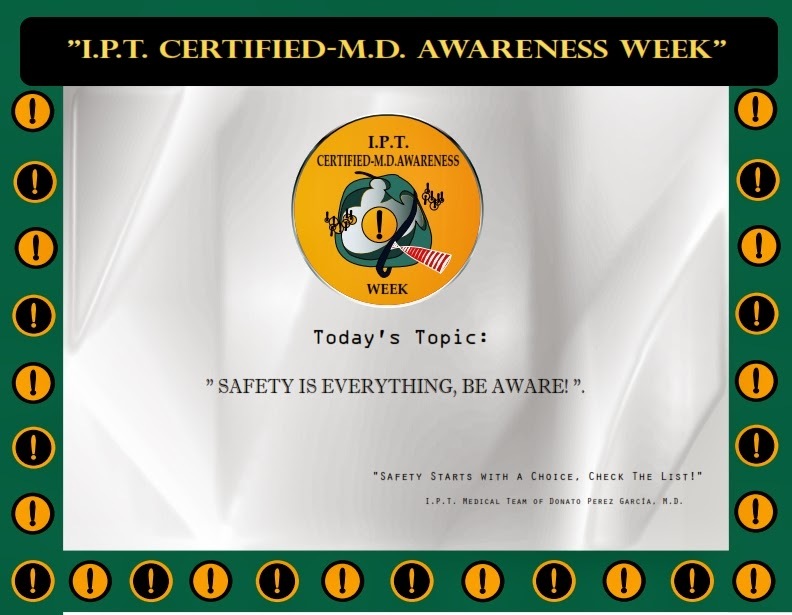 News from IPTLD & Dr.Donato Perez Garcia,MD : SAFETY IS EVERYTHING, BE AWARE! On today’s topic in the “I.P.T. Certified-M.D. Awareness Week” we’ll talk about SAFETY and the importance of your awareness when making the decisions. Not just about I.P.T. Physicians, but your safety in general. If life teaches us something, it’s that we don’t have control over many situations in our everyday activities. Life is a constant test with new problems and challenges that require solutions, and solutions require choices. Every morning we wake up, we make a conscious choice to get out of bed, drink tea instead of coffee, wear blue instead of yellow, greet our neighbors or not, put on a seat belt, etc. It’s choice after choice, and each one we make is with the finality of our best interest, or that of someone we care for and love. There’s so much choosing each day we’re no longer aware of this fact, but it’s true. We do what we do, and don’t do, with the purpose of our being well and our better good. In this awareness campaign, the I.P.T Medical Team and Dr. Donato Pérez García want to emphasize the importance of Your Safety. We’ve carefully chosen our slogan: “Safety Starts with a Choice” because it’s absolutely true. In all aspects of our lives. There is so much we don’t have control over; starting with the weather, the morning traffic, tax deductions, our neighbor’s loud dog, the dust in the wind, even other people’s behavior towards us. The list is endless. But we as human beings adapt to that sense of uncertainty, each day we begin a new bright morning hoping for the best, even though we don’t know what may happen. Part of it is faith and hope in the goodness of life. It is an unconscious trust in the invisible that we can feel during special moments in our lives. But we have to do our share of the work too! We don’t control many things but we do have control over our actions, non-actions and decisions. We don’t control the weather but we can choose to be prepared and protect our selves from heat or cold. We don’t control the crazy traffic in the morning, but we do control how we drive and keep our car or motorcycle in good mechanical conditions. We have the freedom to choose and protect our selves from all that we cannot control in life. And that goes for people as well, we’ll never have control over another human being’s reaction or actions, we’re only responsible for our own. But you can always choose to be safe and have the right to protect yourself, the best way you see fit, without harming others. * RESPECTING THE BRAND OF I.P.T-IPTLD® AND ITS FOUNDER. * THE OFFICIAL LIST OF CERTIFIED I.P.T. PHYSICIANS. * IS MY DOCTOR AN I.P.T. CERTIFIED PHYSICIAN?